In India, Rice is very important part of daily diet. The variety of rice and the number of recipes available for cooking rice is amazing. Just by adding few little its ‘n bits can turn plain boring rice into a pleasurable experience. In our kitchen the maximum cooked food is rice. My hubby and myself prefer taking rice dishes for our lunch box. So it’s a big challenge for me to find out and try out different rice recipes so that we don’t get bored of eating rice. For us every meal is very important in out daily diet. Making not just a tasty food but also a healthy food at a same time can be sometimes daunting. But hey… I love such challenges and love experimenting new recipes in my lab, that’s my kitchen. Here I'm posting a simple rice recipe. Its Peas Pulao. Soak rice in water for half an hour and drain excess water and keep aside. In a pressure cooker heat ghee and add cinnamon, cardamom, pulao leaf and cloves. To this add half of sliced onion, ginger and garlic paste and fry till onion turn transparent. Then add rice and fry for 2-3 minutes. 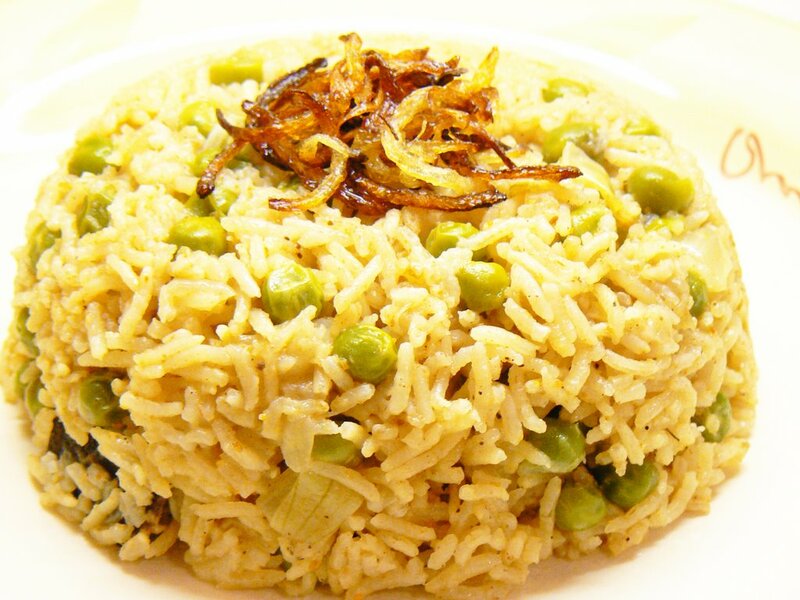 To this add green peas peas, pulao masala, salt and pepper powder and mix well. Add milk and enough water and pressure cook the rice till its done. In a pan add about 1/2 tbsp of ghee and fry remaining onion till they turn brown and crisp. 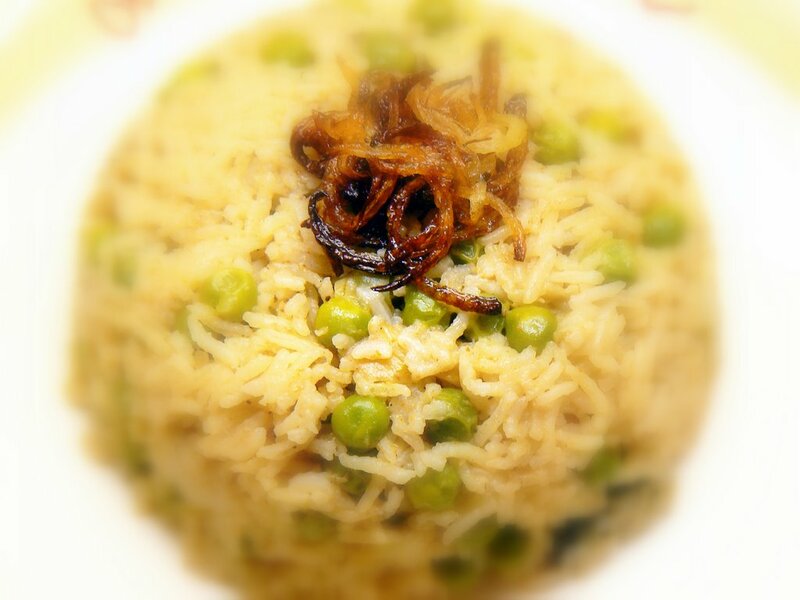 Garnish peas pulao with fried onion and serve hot with Raitas. U can get it in the MTR brand suggested by Sia herself. I've tried it and it turns out absolutely delicious. nice pic again ....ur pics are so very tempting yaar ...by the way was this special for "D" day? I love peas pulao! It is just so yummy! thanks for the recipe. That looks good...and yep, the pulao masala does add that extra 'kick'! Hot Matar-Pulao and Cold dahi is my all time fav. meal!! Hey,that music is nice.. do you like instrumental music? I'ma big fan myself! 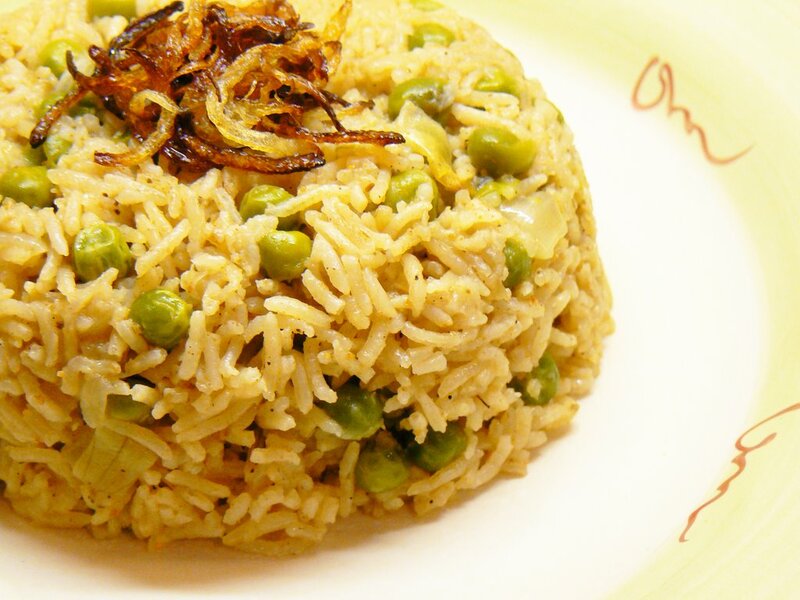 i served peas pulao with tomato, onion raita and it was really good. Thanks so much Supriya, Ganesh bhagwan is the one I worship regularly, so I'll love it!! you should meet me on Yahoo messenger sometime,here's my email. 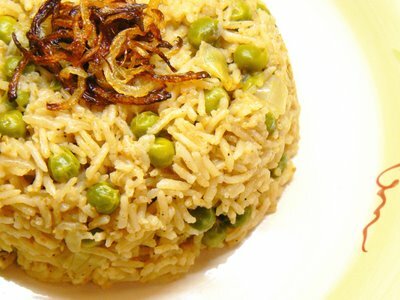 I have never tried pulao with pulao masala or milk... will try it soon. Thanks for sharing. nice blog and such nicely you presented. If you are Supriya, then what's Sia? The fried onions on top of your pulav are tempting me so much. Damn! I really admire the way you display your recipe and its fun to read . I knew about your passion for cooking. Im more than happy to see the way you have kept it going. Keep it up babe. U hvn't mentioned when to add the peas??? It is supposed to be Peas Pulao right???? thanks for pointing out. have made changes. i browse through your blog quite regularly nowadays! Its really interesting , the pictures and anecdotes make it so much fun to read through.. im a beginner at cooking and your blog has become a great inspiration for me! p.s. what can i add instead of pulao masala and king masala? as for your queries, use garam masala (around 3/4 to 1 tsp) or u can skip it all togther as the whole spices used will be enough to make the pulao fragnant! to cook the rice to perfection here is what i do. use 1:2 rice to water ratio. so if using 2 cups rice here use 4 cups of water or little less than 4 cups if using basamati rice. also soak the basmati rice for at least 10 mins in water before cooking as you will get really long grained rice once cooked. since u r using 1/2 cup of milk here, use around 31/4 cups of water and your rice will not turn our mushy. hope this helps.